A happy Monday calls for a happy picture! How would you like to go to work and be surrounded by people who are as energetic as Joseph, Ryan and Song (from left to right)? This picture makes me smile just by looking at it, and I think I will put it on the wall in my office to remind myself why I do the work I do whenever I have a tough day. Happy people = productive people. 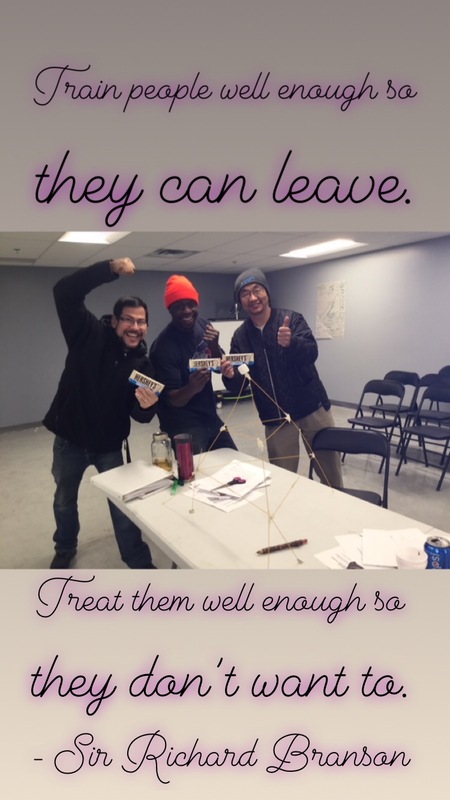 These 3 guys have just recently participated in my Leadership Excellence Series, and it was truly amazing for me to observe their effort and their progress over the course of only 4 months. Bravo! Their efforts will result in lower absenteeism, decreased turnover, better health & safety records and a more engaged workforce. You can take my word for it. Awareness is the first step and part of the process on the road to exceptional leadership behaviours. There is no turning back. Manufacturing companies in Ontario are still not as progressive as they could be when it comes to engaging in external leadership training, and this despite government funding that reduces employee training costs by up to 83 %. I encourage you to read the Forbes article: “Promoting Employee Happiness Benefits Everyone”. What results do you think people who are happy with themselves, have a constructive thought process and who are willing to learn and to grow bring to their workplace? Your job isn’t to make people happy. Your job is to find out what makes YOU happy in your personal and professional life. Happiness is an inside job. Having said this, you should know that you can definitely contribute to your team members’ happiness. What do you think? Are people happy when you enter the room or when you leave the room? be a leader (with a title or without a title) who leads by example. Having the right attitude is a choice.